Do not settle down to a cuppa and a chat with a girlfriend while cooking beans, if your brain has been eroded by five years of breastfeeding, punctuated only by 42 weeks of pregnancy. Yes, I said 42. Which is how old she’ll be before I forgive her for that. Unless of course you want your house to smell like badly burnt beans for the rest of the day. I bought myself a new toy recently. Today I had my first play with it. It’s a toy I felt perfectly justified in purchasing due to the complete and utter impossibility of buying preservative free tortillas. 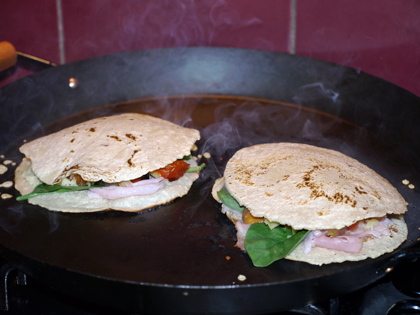 Yep, you guessed it, I bought a tortilla press. Money well spent. 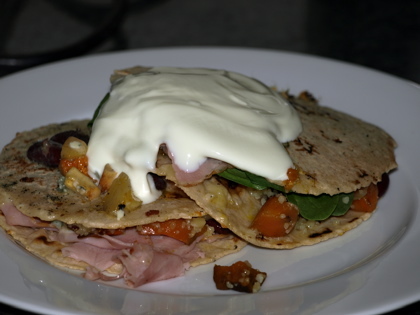 Last time I had a tortilla that good I was in a shonky little cafe at Puerto Penasco, Mexico. drizzle with olive oil and roast. 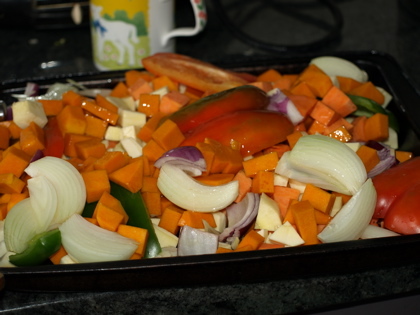 Place tortilla in preheated pan, quickly pile on vegetables and cheese. 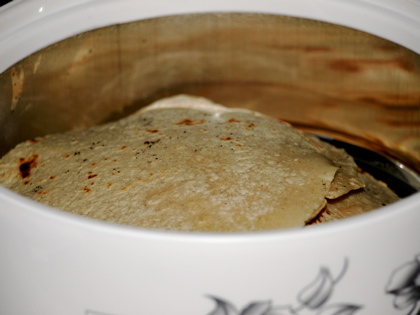 Cover with another tortilla. After about 2 minutes, carefully flip over and cook for another minute. Repeat until there are no tortillas left. Serve with a dob of sour cream on top.